A new design of firebreaks around the Barba Azul Nature Reserve in Bolivia has been successful in protecting the habitat of the Critically Endangered Blue-throated Macaw. World Land Trust’s (WLT) Keeper of the Wild in Bolivia, Rene Cartagena, has been busy with fire management as Barba Azul Nature Reserve, a piece of Beni savanna managed by WLT partner Asociación Armonía, which finds itself struggling through the worst dry season for decades. This dry season over a thousand man-made fires have been started by cattle ranchers, which is problematic for Armonía when the wind blows fires towards the reserve. The rangers on Barba Azul Nature Reserve have so far fought two fierce fires which were started by neighbouring ranchers and passed the reserve boundaries. 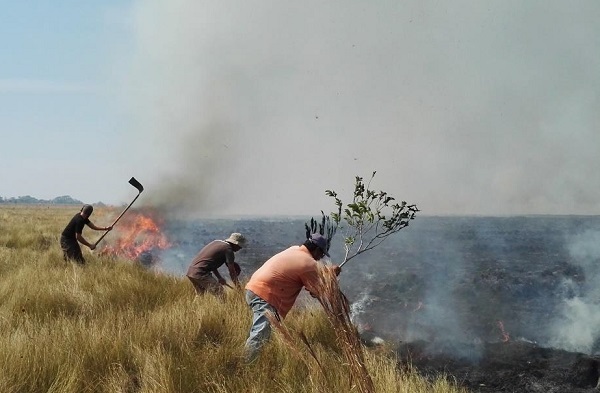 In the first week of September the rangers found a fire crossing the firebreak and approaching the boundary on the south side of the reserve after a neighbouring rancher set fire to his property without warning Asociación Armonía, despite the prevailing winds blowing towards the nature reserve. The rangers teamed up with firemen, neighbours and researchers working on the reserve to get the fire under control within seven hours, preventing it from reaching the forest and field station. On the whole, the design of firebreaks implemented by Armonía around the reserve this year have been successful, drawing on the expertise of experienced firefighters such as Rene to understand the movement of fires in the savanna ecosystem. 2016 is the first year the main foraging area for the Critically Endangered Blue-throated Macaw has not been affected by fires in the dry season. World Land Trust supports the long-term protection of reserves managed by partner organisations by funding rangers’ salaries through the Keepers of the Wild programme. You can contribute to the protection of the Beni savanna and its Blue-throated Macaws by supporting Ranger Rene’s salary.